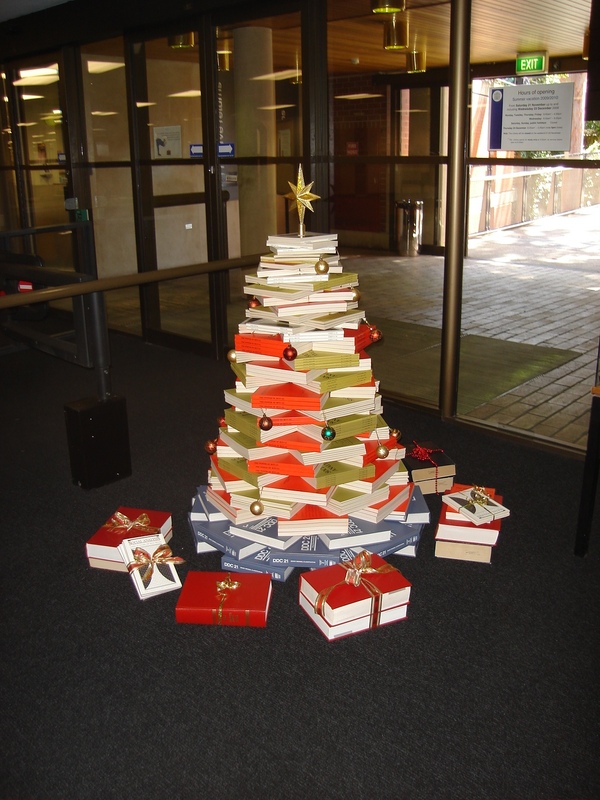 A great idea for celebrating the holiday with books (you could buy them as gifts too...I always do) from the Barr Smith Library in Adelaide. They aren't the only ones doing it, though I particularly like the idea of the books resting on the Dewey Decimal Classification (showing my age). 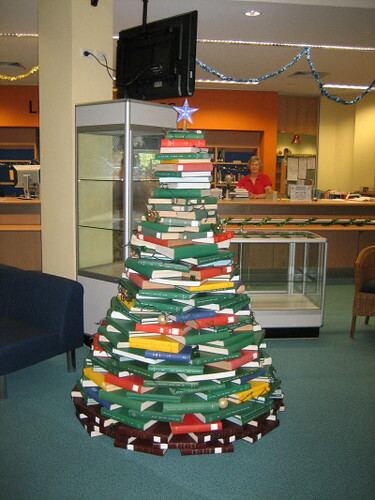 The James Cook Library in Cairns, QLD has also done something similar. My own shelves are definitely overflowing, and much as I love books, I've got no place to put all the new ones that will surely arrive by sleigh in the next few days, especially with the Christmas tree taking up half the living room. Here's the obvious solution. Happy holidays to all of you, and thanks for all your wonderful support this year. Yes, it's a bit odd, but you have to admit it's thought provoking and picks up just a bit on the poem's theme. Two poems of mine from Repulsion Thrust have been published in New Zealand's blackmail press 26. The magazine is 8 years old and has been called "A wonderful blemish on the literary landscape of new Zealand!" The poem Koha was inspired by a Māori poetess who was married to Johann Wolfgang von Goethe's son, who left his wealthy German life behind to live amongst the Māoris during a time of war. It's a great love story that has so many fascinating elements and beautiful dichotomies. The story came to me by way of a friend who is actually related to Puhiwahine (and still uses the name Von Goethe), and will likely form the basis for my 3rd novel, Goethe's Daughters. Amazon to pick up your copy now. Thank you for your wonderful support! Award-winning poet Magdalena Ball has released a new book of poetry that moves across a terrain not often the fodder of poetry. Following up on her chapbook Quark Soup, Ball combines her pursuit for scientific meaning with the steely-eyed observations of a poet, seeking answers to the human condition through Quantum Physics, and measuring human aging against technological singularity, or the loss of love against ecological destruction. It’s an extraordinary and original collection that author, inventor and futurist visionary Ray Kurzweil calls “wonderful … singularity-aware art with a poetic sensibility”. Magdalena Ball was born in New York City and holds a BA from City College, an MA from Charles Sturt University, and has written a Masters thesis on James Joyce and Virginia Woolf at Oxford University. She now lives in Australia where she works in research and development for Orica, a large multinational corporation, a job that often provides inspiration for her work. She also runs the highly respected compulsivereader.com review site. Her novel Sleep Before Evening, published in 2007, was a Next Generation Indie Book Awards Finalist. "Precise and exciting. Words sizzle on the page. Images steeped in the physical world work beautifully to illuminate complex emotions and states of mind. Magdalena Ball is an important poet." Joan Schweighardt, author of Gudrun's Tapestry, Virtual Silence and other novels. Publication Date: 2 December, 2009 *yeah, I know, but I bought a copy for my mother, so I know you can get it now! Available through Ingram, Bertram Books, Gardners, Baker & Taylor, Ingrams, Amazon, Barnes & Nobles and good bookstores everywhere. Available through Ingram, Bertram Books, Gardners, Baker & Taylor, Ingrams, Amazon, and good bookstores everywhere. I'm very pleased to have a visit today from Kristin Bair O'Keeffe, who talks about her novel Thirsty. Talk to me about Thirsty. What gave rise to the book? Thirsty is the story of one woman’s rather unusual journey through an abusive marriage, set against the backdrop of a Pittsburgh steel town at the turn of the twentieth century. Because I have a history of domestic violence in my family, I’ve done a good bit of thinking about it over the years, both personally and as a writer. Somewhere along the line, these two inspirations merged and Thirsty was born. Did you write the book after moving to China? Was it inspired by your travels? Actually I wrote the first scene of Thirsty in 1992 when I was a grad student at Columbia College in Chicago…long before I moved to China. Once I dug in, I was hooked. I became obsessed with steel mills, steel making, the life of women in Pittsburgh at the turn of the twentieth century, the psychology behind a woman’s reason for staying in an abusive marriage, and the journey of the main character, Klara Bozic. Since moving to China in March 2006, I’ve actually discovered that Shanghai today is in some ways strangely similar to steel communities in Pittsburgh at the turn of the twentieth century. For example, the streets of Shanghai are filled with cart-pulling entrepreneurs who specialize in various goods and services; there’s a guy selling oranges, a woman collecting wood to recycle, a man selling stockings and nylon socks, a knife sharpener, and lots more. There were cart-pulling entrepreneurs all over the place in Pittsburgh steel communities at the turn of the twentieth century; you’ll see them when you read Thirsty. Who would have thought? (To get a glimpse into my writing life in Shanghai, check out the video interview with me at YouTube. Tell me a little about your life in China - why did you migrate? Until that moment, I hadn’t ever considered living in China. Italy? Sure. Greece? Absolutely. But China? How did you find Swallow Press (or did they find you)? I did. And voilà! A short time later I had a book deal. Talk to me about some of the promotional complexities that you've got. Is most of your promotion via Internet? Are you able to tap into ex-pat writing groups/communities or do you really feel like your day to day life is in one location and your 'book life' is in another? Thankfully I’m a creative soul and a determined author. And because I’m also the reigning queen of VPNs (Virtual Private Networks), I manage to get to blocked websites on a fairly regular basis and therefore connect quite often with readers and writers. We also have a terrific reading/writing community in Shanghai, and folks are very supportive of fellow expats. In the coming months, I’ll be doing as many events in Asia as possible. Right now I’m scheduled to speak to a handful of reading groups and give a talk at the most amazing Shanghai International Literary Festival (March 2010). Living in China and publishing in the U.S. has forced me to think outside of the box. There’s lots more creative marketing ahead. Stay tuned! You're a real juggler aren't you? (I know what it's like!) Tell me about some of the things you're juggling right now, and some of the balls you hope to add into the juggling mix in the future. Yep, if this writing thing doesn’t pan out, I’m sending my resume to Cirque du Soleil. Seriously though, in addition to being a new author, I’m mom to a brilliant, energetic, chatty 22-month-old. I blog, run a reading series in Shanghai for local writers, teach writing, and write a monthly column for Writers on the Rise. [link = http://writersontherise.wordpress.com/] I’m close to completing my second novel and a memoir (that’s the book about China). Since my husband is from Ireland and I’m from the U.S., we do a good bit of international travel. Therefore I spend a good bit of each year recovering from jetlag. All in all, it’s a pretty cool life. Next Tues, 24th Nov at 10am (Sydney time), I'll be chatting about poetry and science on the 2nd stop of my book tour (and book isn't even out until the 2nd of Dec! How keen am I?) at The Starlight Zone on Radio 2NUR, with Col Maybury. This is real radio, but will also be recorded as a podcast, so if you miss the show, stay tuned for a podcast link. Netera Landar talks to "me" (that's Poet Ozigard - whether it's me or not is the subject of poetry) at the Terric Coffeeshop in Second Life (whether or not that's a place is a subject for Philosophers). This is kind of ground breaking (whether or not it is is something I'm open to discussing), and new (for me at least...), and I'd love for you to join us. Second Life is free, and you can join in and interact with us in the session. Please come along, even if you find it creepy, and help support "me" as I muddle my way through virtual reality. Refreshments available (whether or not they're refreshments...). That's 7pm Central US time on the 10th (12 midday on the 11th if you're in Sydney). As I prepare for another book launch, I thought it might be fun to do a little tongue-in-cheek look at the product life cycle stages of a book (also needed to do it for the marketing degree), an area where serendipity often rules, and where formal marketing is often not applied well. This will obviously vary depending on the genre and fame of the author (it’s definitely a brand game…the brand being the author or even the author’s pseudonym, such as Lemony Snicket). Prior to introduction is the pre-publication stage, which works through all the standard New Product Development elements of idea/concept/analysis/product dev’t (the 'writing’)/test marketing (call it the editing and submission – it often leads to re-writing or even back to the idea stage), and finally commercialisation, which includes such things as choosing a final title, size, layout, printing, and cover design. The book has been launched. Most earnings at this stage are used to pay for the printing and editing costs and are therefore negligible (in many cases, they tend to stay negligable). At this point, low-cost activities like press releases, publicity events, review garnering (through sending out review copies), entering competitions, social networking, and media events on radio are combined with advertising and hand selling, in order to generate interest and reach prospective, targeted customers (taken from market plan and segmentation list) and motivate them to purchase the book. If you know what you’re doing, you’ll have done a lot of promotional work throughout the late pre-publication phase as part of commercialisation, so that reviews will be flowing in now, and people will have been anticipating your upcoming poetry book even more hotly than they're anticipating the new Matthew Riley novel (then you woke up). Online promotion is particularly important here as virtual book tours remain online permanently, and if people are talking about you, then it is at this stage that the word begins to spread. So doing really good promotional work in the introductory phase will start to pay off in this stage. At this point, a prize win would really come in handy. There are quite a few good prizes available, but of course many applicants, and winning is never guaranteed. Still, if you’ve produced a high quality product and entered competitions during the introduction phase, you might hit it big at the growth phase, and then Riley and Dan Brown had better watch out. Failing that, a few innovative readings (gimmicks like pole dancing while reading your poetry or having a launch in Second Life for example) can also help generate buzz in the right places. Once you’ve reached the break even point and profits are starting to be generated, you can invest a bit in promotion and try to get into trade shows, great book trailers, some small scale touring, and advertisements to sustain the growth. Of course, no party lasts forever, and Dan Brown is taking up all the shelf space in the bookstores and no one buys poetry (except your relatives, and neighbours and work colleagues and they’ve now all got copies), so sales slow down and the product enters the maturity phase. You’re onto your next book in any case, so you’ve stopped investing and are just raking in the residual profits (at 10% of the publisher’s wholesale price, that’s about $1 per book, so you should get a few cups of coffee). The cash cow is nourished and you can just milk it for as long as possible until sales peter out altogether. Or…you could shift your strategy and try looking at alternative pricing strategies, like heavy discounts or freebies ('buy a copy of my poetry book and I'll give you Angels and Demons for nothing'). You could do an Amazon ‘bestseller’ campaign. Or put the book on Kindle and do a new launch of the e-book. This might just create you new markets (especially if the ebook is really inexpensive or has pretty pictures you couldn't afford to put in the print version). You could find new users in a fringe market – for example, you could try being the first person ever to create a totally virtual poetry book with an avatar reading each poem outloud. If you got a good soundtrack and did the whole thing ‘live’, then it might just be novel enough to give your book a second life (2 puns in one sentence) and get you onto Today Tonight. You could have the book translated into different languages and capture the growing Madagascarian demand for scientific poetry. You could teach classes and make your book the required text. Or you could just let your book move on to the next phase (which will probably happen anyway). Since you’ve got a day job and don’t have time to do any of these clever gimmick ideas, your sales eventually vanish and any books still on bookstore shelves are returned for a full credit. Readers are onto the next big thing and your name is history. So it’s time to ease off the promotion and move on to the next project. If you’ve got a few boxes of books in your wardrobe, you can donate them to a charity or library (literacy club/auctions, etc) to create goodwill, or you can give them to friends for birthday presents for the next 5 years, which should also give you more time to write since you'll no longer get invited to birthday parties. In this phase, your marketing will probably be reduced to minimal levels, but there may still be opportunities for sales in the future as other titles come out and more buzz is generated. Online promotional efforts tend to stay in place permanently, so that book trailer is still being checked out on YouTube, and your blogs are all still around. A few sales here and there may just get you the odd cup of coffee. Unlike corporate products, books don't have to maintained, unless you're with a big house that pulps you and erases your name from history (for more on that, read Carlos Ruiz Safron's The Angel's Game). If that happens, well, just write another book and start over. You probably weren't making much anyway. Obviously the strategies needed for each stage have to be different as the market is continually changing around your product. Competition in this arena is fierce, and there's always someone else looking to create buzz (turn your head for a minute and your Twitter is deeply submerged). Some of the natural impetus around each phase will help keep things moving (keep Twittering) but as the product moves from introduction to growth to maturity to decline, it is important to change your strategy so as to take advantage of natural interests and investment opportunities and to help ease the transition as the market peters off. Like any business, you've got to balance the creation of new products (when is your next book coming out?) with the exploitation of existing ones and if you don't maintain the balance then your business will falter. The evidence generally comes in the form of sales or lack of them, and overall interest/responsiveness to campaigns so it's quite clear when you're transitioning from one phase to the next. It tends to happen organically. The one thing you can generally influence is how long you remain in each phase, but there's still a point when you know you've got to move on. I'm pleased to announce that She Wore Emerald Then, my collaboration with Carolyn Howard-Johnson, has just been announced as a finalist in the 2009 USA Book News Awards. Jeff Keen, President and CEO of USABookNews.com, said this year’s contest yielded an unprecedented number of entries. USABookNews.com i s an online publication providing coverage for books from mainstream and independent publishers to the world online community. 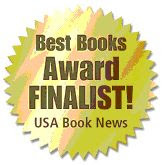 A complete list of the winners and finalists of the USABookNews.com National “Best Books” 2009 Awards are available online at http://www.USABookNews.com. She Wore Emerald Then was originally conceived as an alternative to the cloying greeting cards usually available for mother's birthdays, mother's day, and other holidays in card shops for about the same price as a card (with much more punch). This is the second in a poetry chapbook series designed to serve as themed giftbooks. Other books in the series include Cherished Pulse, celebrating 'love' in all its unconventional guises, and the upcoming Imagining the Future, celebrating fathers, fatherhood, and men in all guises. For more information about She Wore Emerald Then, just click on the book cover. Does everyone have books tripled stacked on their shelves (a shelf in every room), squished in under dressers, under the bed, and in boxes on top of cupboards? This is just one of the secret book stashes in my house (not too good for the books, I know -- I'm not a collector, just a reader). Where are your secret stashes? Anyone who can identify one of these titles will win a prize! I thought I'd make sure that the last blog post didn't come across as too pedantic (and because boychik tells me people like to be told what to think), I thought I'd provide a list of 10 books to change your life. Let me begin by making it clear that this isn't going to be a list of self-help books. I'm not a huge fan of the plethora of self-help books which will tell you how to do everything and anything better (and I'm sure there are plenty of lenses out there to provide that information). To me, the only kind of self-help that really works is something that begins and ends with you. That isn't to say that books don't make excellent tools, or that you won't find advice that it worthwhile in a self-help book. However, for me, real life changing is the kind of epiphany that comes when you start to understand something about yourself. And the best books for inspiring that in me have always been fiction. Why is that? Probably because the best kind of fiction opens a door -- providing words that weren't there before to allow me to see my world in a broader light. The best kind of fiction is scary, intense, beautiful, funny, but above all, it's about the reader, about humanity, about the way in which we choose to live. It doesn't teach through prescription. It teaches by taking us there -- by showing rather than telling -- by allowing us the insight of experience. So herewith is my list of 10 life-changing books. Most of them are novels of one sort or another. Most of them (but not all) have won great critical acclaim. I've probably (definitely) left something important out. Forgive me for that. There are great books coming out all the time, and I haven't read everything (but I'm working on it!). Ulysses by James Joyce What else. Everytime I read this I find something new, and am inspired to write more, to explore more, to think about my own life (and my family) in broader terms. This is the book of books. It isn't easy, but unlike a quick easy "airport novel" or "beach read" it keeps repaying the effort of reading. Foucault's Pendulum by Umberto Eco Forget about Dan Brown. When it comes to the mysteries inherent in religious orders like the Templars or the Rosiecrucians, Eco is impossible to beat. Add a dash of literary panache, and more erudition than you ever encountered in one renaissance man, and a great, engaging story that raises as many questions as it answers. I've read it three times and that just isn't enough. A Short History of Nearly Everything by Bill Bryson Okay, this isn't fiction. It isn't self-help either, but by god Bryson has a way with words. He's a true master at turning science into poetry and illuminating the absolute beauty, mystery and richness inherent in the universe around us. I wrote a whole poetry book after reading this I was so inspired. Gould's Book of Fish by Richard Flanagan You need to read this one in full colour. This is a big, funny, sprawling, heady, monster of a novel masquerading as historical fiction. It's not. It's literature pure and simple, and will leave you breathless at its alchemy. Also a rocking good story set in a Tasmania prison. Oscar and Lucinda by Peter Carey Does this one surprise you? It won a Booker Prize, and well deserved too. I read it during my first labour, so was a little emotional, but it was so beautifully written I only stopped when the contractions were 3 minutes apart! Despite having a wonderful cast, a great director, and a lovely setting, the film was awful, but the book is magnificent. A true testimony to the literary power of one of our greatest modern authors. Reads like a romance. But its about so much more than this one relationship -- it's about real love, about loss, about hunger and addiction. All of Carey's work is good, but this one is beyond good. History of the World in 10 1/2 Chapters by Julian Barnes Like Carey, Barnes is one of our modern literary masters. Everything he's written is worth reading, but this book is life-changing. Like every book on the list here, it's very funny, and often challenging, innovative, and linguistically rich. The book works on multiple levels -- and tells a number of disparate stories (including Noah's Ark from the point of view of a woodworm) which come together in a kind of firework display of meaning. Orxy and Crake by Margaret Atwood or maybe The Blind Assassin, The Handmaid's Tale, or Alias Grace. But I really liked Orxy and Crake because, despite being a distopia, bordering on sci fi (which I normally wouldn't like), there's so much here about who we are now. Also I couldn't stop laughing, but it was never ridiculous, and always moving, intense and scary. Midnight's Children by Salman Rushdie but this could also be The Satanic Verses or The Moor's Last Sigh. Rushdie is so heady -- his work is full of sensual, almost purple richness -- the characters speak a language which is near made up and the scenes border on magical realism, but always rooted in great, almost epic heroines and heroes, and a kind of Bollywood humour. Always, always, the work is underscored by a great love for humanity in all its quirky freedoms. One Hundred Years of Solitude by Gabriel Garcia Marquez Picking and choosing now that I'm near the end of my list is hard -- there are so many good books out there. 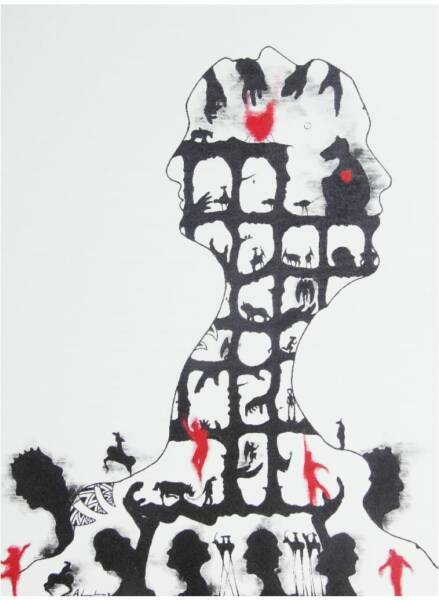 But Marquez' work is so distinctive. In many ways, it follows Rushdie's in illuminating just how vast the human potential is. But the sensuality is of a very different kind. More fruit and less spice. Great Expectations by Charles Dickens Dickens is a wildcard here and deliberately so, but there's something so modern about Great Expectations. Perhaps it's the maturity of his narration, or the way in which the Magwitch's pain is tranformed into something glittery. Like the other books on this list, the humanism, the love of the quirky, and the absolute clarity of the writing to say things it never said before makes all of Dickens worth reading (but I have a particular fondness for this book -- you could also check out Peter Carey's Jack Maggs as a follow up). Of course there are many more life changing books out there, and I've just thought of 10 more while pausing to sip my coffee. But don't just think of truth in terms of 'what really happened'. Truth is something much deeper -- something that only art can get at. Great literature is art. 'Best-Smeller' Lists: Should You Turn Your Nose Up At 'Top-Ten' Abuse? As a book reviewer, I’m always being asked to rate my top 10 books for the year, for the century, for all time. People seem to have an insatiable desire to read about top lists. For example, the Telegraph has just published a list of the 25 most influential books in world literature. In The Guardian this week, John Curran gives us his top 10 Agatha Christie Mysteries. The British periodical even has a whole page of top 10s, including top 10 psychological journeys, top 10 books about outsiders, women poets, short novels, books set in Japan, even smelly books. It’s easy enough to come up with a list, and as an author, I could be forgiven for desperately wanting to be included on one of these lists (with the exception of most smelly), as I’m sure they’re excellent for sales. But are they worthwhile? Do they have a function other than to guide readers towards specific books in bookstores? I can see the pros and cons. On the pro side, they call attention to what ought to be quality-based work in a crowded market. Readers who aren’t sure what to buy can use this as a guide, especially if they trust or have similar taste to the compiler. Just print, bring into Borders, and bang, your Christmas shopping is done. On the con side, any list is both subjective (like, I have to admit, a review), and exclusionary. My top ten is not only limited to what has come into my view, but also limited by the time and place in which I pull the list together, and by the need to limit the number I choose. Even when I have created such lists (and I have to confess that I even have one of those “so you’d like to..” lists on Amazon), there are always great books I’ve just forgotten to include. And there must be thousands of wonderful books I’ve never heard of, or heard of but never read. That said, I’m sure the next time I’m asked what I think were the best books of 2009, or the ten best young adult books, or the best literary fiction of all time, I’ll be ready and eager to share my list. I may also go and have a look at The Guardian’s list of lists the next time I’m looking for new authors to read – after all, if it’s good enough for Cormac McCarthy, it’s probably good enough for me. But my list won’t be comprehensive. None are. It isn’t that I don’t like Oasis. I do. The words may be a little clichéd, but surely that doesn’t matter in a song lyric. What does matter, at least to me, and maybe only to me, is that they work semantically. You just can’t walk slowly, faster than a cannonball. Or maybe these two lines aren’t meant to go together. But surely “Someday you will find me/Caught beneath the landslide/In a champagne supernova in the sky” is meant to be listened to as a single image. I like the imagery. Caught beneath the landslide is nice. So is a champagne supernova in the sky. I can picture both of them vividly. But not together. I'm trying to imagine sniffing Alka Seltzer through a cane (never mind the train) but it isn't working. My husband tells me I’m just being stupid. No one listens to song lyrics. He even got angry when I suggested that Motörhead’s "Killed by Death" was a terrible tautology. Unless, I mused, while his face reddened, it’s a personified death – like the grim reaper. “Stop it!” he shouted. "It’s rock and roll, not poetry." But the words are still there in front of me. I’m not talking about songs which are acknowledged as stupid. This isn’t a blog about "Muskrat Love," "Afternoon Delight," "Kung Foo Fighting," or anything by Bobby Goldsboro. I’m writing about respected songwriters who can turn a phrase with the best of them. Hang on, I get it. It’s drugs. I don’t do enough to dull my sense of semantics. Otherwise I might find “an eagle in the eye of a hurricane that's abandoned” profound rather than confusing. I know Kate Bush doesn’t do drugs though, because she says so. But my kids were listening to her latest the other day when they started laughing hysterically. "What’s so funny?" I asked, looking for camaraderie. She’s singing, rather seriously, about a washing machine, they managed to get out, between tears and hiccups. It isn’t just the lyrics. It’s Kate’s extended soprano during the chorus that gives the song an almost operatic feel. That’s obviously the impact of motherhood on her. Wouldn’t want to forget the mashed spuds now – the perfect party accessory. I like Dylan. Even more than I like Oasis. And many of his lyrics are great, so I suppose a few duds are inevitable. But what about “Follow me, don't follow me/I've got my spine, I've got my Orange Crush?" What about “Lights will guide you home/And ignite your bones/And I will try to fix you?" Like Dylan, both REM and Coldplay are lauded for their excellent lyrics. But what's the relationship between spines and Orange Crush (presumably the soft drink). The lights guiding bones are presumably something like plane landing lights, and I can see them guiding home, but igniting bones? They must be pretty hot. Maybe, as my husband keeps telling me, I’d better stop listening so carefully. The point isn’t to make sense, he says, and who cares about mixed metaphors? You’ve got to take the music as a complete package. Its purpose is to make people dance, sing along. So sharrup. Give me back Oasis, please. It’s only rock and roll, right? As the Editor-in-Chief for the website The Compulsive Reader, I get about a hundred review requests a week. Of these, maybe one will be accepted. Not because ninety nine of those aren’t good books, but because we simply don’t have the people power to read and review everything out there. And there is so much out there. How do we filter? For me, I try to filter on quality. If a book strikes me as being, in some way, extraordinary, I’ll try to take it on, even if I’m already overloaded (and I am; I am). All writers are my ‘fellow writers’. We are all plying our trade, and most of us doing it in conjunction with a day job, families, and a ton of other commitments. I want to help everyone. But I can’t. Every now and then, someone I “bump into” online will strike a personal chord with me. We’ll ‘bond’ in a virtual sense, and keep up the conversation, continuing to support each other’s work, and communicate our triumphs and losses. I think you could call it friendship, though perhaps not quite in the conventional sense. When the time comes when one of my friends needs a review, back cover quote, some advice, or help with promotion, I’ll be there. Why? Isn’t this a kind of literary favouritism? Does it really help? I believe it does. Here’s why. A healthy concern for those who have similar talents, ethics or who are members of our family/social circle is part of what it means to be a human. We can’t help everyone. But we can, and should, help those that we care about. It’s the bedrock of our social existence. Some might call it nepotism, especially if family is involved (and I have a rather artistic family – we all support one another), but I agree with author Adam Bellow (In Praise of Nepotism, Doubleday, 2003) that nepotism, when combined with meritocratic principles, can be a positive force. 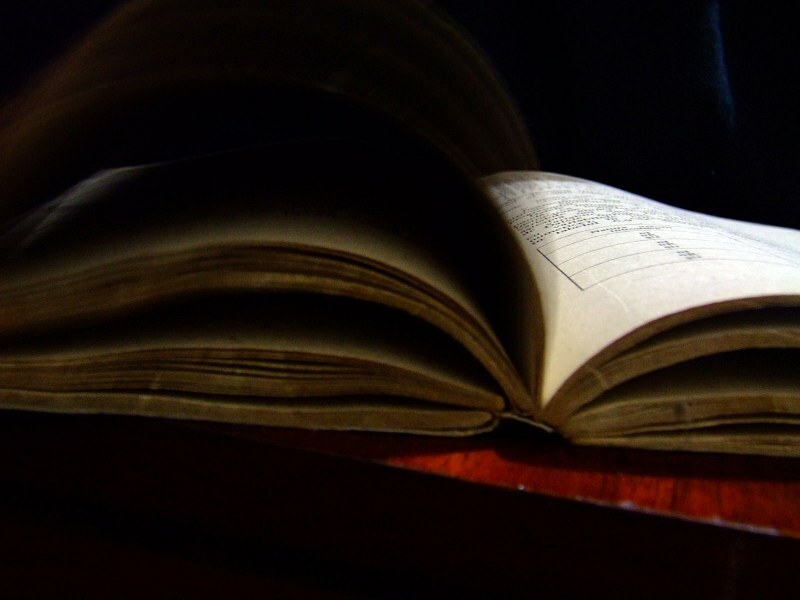 According to UNESCO, there were just under half a million books published in English in 2005. Of these books, a large number of titles won’t sell more than 100 copies. There are many more books on the market than book buyers. Most book buyers will purchase books based on familiar names. Emerging authors need all the help they can get to simply get their titles noticed amongst the hype and names that dwarf them, but few of us can afford the publicity powerhouse that big names get as part of their publishing packages. Supporting one another is one way to help redress the already negatively skewed balance. As professional writers, we treat what we review professionally, regardless of whether it was written by someone we know or a stranger. So when I review a book by a friend, I review it in the same objective (as objective as any book review can be – we always bring in our tastes, biases, and perspectives) way that I would review any book. I don’t always give my friends glowing reviews. It isn’t easy, but I have occasionally had to refuse a review, or have had to publish a review which is negative. That happens. Friendship doesn’t mean I compromise my integrity, otherwise my review or support would have no value. What it does mean is that I’m willing to give your book some priority in my crowded stack. Writing can be a solitary occupation, but promoting a book isn’t. Being in a position to help someone whose work is superb is inherently gratifying. We are all disciples at the altar of the well written word, and promoting excellence wherever you find it is a privilege. That said, the production of my first novel, Sleep Before Evening, found me in a position where lots of people were needed to help me get the word out. I got a tremendous amount of support, and in this dog-eat-dog world where money and celebrity often rules over quality, that support helped me as much emotionally as it did in terms of my book’s success. Writing novels is a mug’s game, at least in the beginning. It can be immensely gratifying, but it is also painful, hard work. Helping one another is also part of the game. Without the support and community of like-minded authors, there’s simply no way to get one’s foot in that tiny crack of the promotional door. The more we help others, the more we help ourselves. Social networking is the hottest buzz around for writers, and the kinds of networks we develop, with people whose work we admire, helps define who we are. So why not offer your writerly support to someone today. Offer to do a review, host their guest blog, go out and buy the book of someone whose writing you admire, or just mention their work in your blog. It’s the kind of good deed that will come back to you. How do we distinguish between good and bad poetry? There are plenty of people who will say that it’s impossible to judge – that quality is a subjective thing and that one man’s literature is another’s junk. As a book reviewer who spends many hours a week judging the quality of a range of books, many of them poetry collections, I disagree with that. Of course there are always subjective elements to any assessment, but there are also objective criteria which we can use to judge other people’s poetry and also to ensure that our own work is consistently high quality. They aren’t a guarantee. According to Martin Amis there’s only one way of judging quality, and that’s time. There’s not much you can do to ensure that your writing will survive a generation. But there are elements that you can find in other work, and strive for in your own, that will help. I’m sure that there are more, but I’ve narrowed down my list to 3 things: originality, surprise, and connection. They are intimately related to one another. One way in which to attempt this is to employ that old chestnut of showing rather than telling. Concrete images, sensation, detail, and above all, your own individual, resonant voice all provide unique elements that, combined, no one else can quite replicate. Another way is to get rid of the junk: the cliché, the trite, the laboured, and go straight for the reader’s jugular. The reader needs to be brought into the poem. We need to feel the words in our own bodies, enriched by our own individual package of experiences. I love the denouement of a great poem. That moment of shock and wonder when we feel the chair is pulled from beneath us (and no hard bump at the end). A good poem should surprise us with its novelty; it should reveal something unpredicted. How? There’s no straightforward answer to this, but masterly employing poetic devices: sensatory, auditory, emotive can help. Another good trick is to pull together elements which might, at first seem discontinuous. Call it a clever use of dichotomy if you want to employ the critic’s tongue. Pick on things that are often not poetry fodder and turn them on their head. Write about love by looking at the cosmos (that’s my trick – hands off :-), or death by looking at a newborn, or a piece of clothing dryer fluff (always makes me think of death). It isn’t enough to use language in novel, surprising, and even powerful ways. Your work has to connect with a reader. It has to mean something. That’s the bottom line. 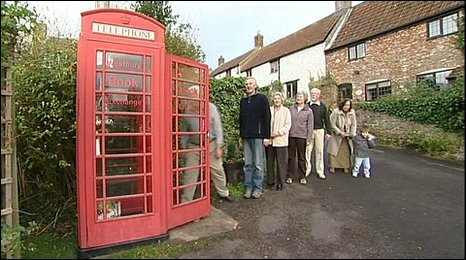 It is sometimes difficult to toe that line between obscurity and originality. Not everyone will be coming at the poem with the same vocabulary and set of internal references. Nevertheless, there has to be some kind of overall thematic going on, and it has to have a degree of universality for a poem to be high quality. A poem so personal that it only means something to the poet isn’t high quality. Similarly, a beautifully written poem that doesn’t yield something: a question, a point, empathy, a challenge, an idea, just won’t move the reader. We’ll be locked out. Good quality poems do the opposite: they drag us in, sometimes kicking and screaming (I'm probably the only one who kicks and screams while reading poetry...). This is a multimedia poetry piece I created about a year ago, but this blog business makes for a nice kind of compendium, so I might actually put in some older stuff from time to time, not only to buy me a little time to actually create something new (working...working), but also to keep track since I have work all over the place. This piece contains (with permission) part of a wonderful song called Kopanitsa (Version 2), which is a traditional piece arranged by Mara Kiek, Llew Kiek, Jim Denley, and Haughton. The musicians playing are Sandy Evans, Jim Denley, Steve Elphick, Llew Kiek and Mara Kiek, aka Mara. It's from their album Don't Even Think. The words are mine and the images were done by Pete Patterson and May Lattanzio (messed about by me). Spring is definitely on the horizon here in Australia. Attention spans are shortening. I hear it all the time, and don’t doubt it either. People are bombarded with fast-paced moving imagery on television, in computer games, in media of all types and we scan, cram, multitask, grab a quick bite and move on. From a literary perspective, Noah Lukeman tells us that we get five pages to capture an agent or publisher’s attention, and there is evidence that the same is true for readers. If you don’t grab their interest quickly, well, there are plenty of other books out there that will, besides, we only have five minutes to devote to reading. But is this good? From the perspective of a reader, is it wise? There are some novels that will grab you from the first page and hold on until the last. Some of the more successful young adult books have developed the “cliffhanger” to the point of perfection. But just because a book is slow or languid, doesn’t necessarily mean that it isn’t engaging. Sometimes engagement takes time and effort, and complex meaning needs space to unfold. I find that, even on re-reading, anything by Virginia Woolf needs a reading of the entire book before the full power and meaning becomes clear. Judge too quickly and you’ll miss the big picture. The last book I read (re-read) – Life of Pi – was the same. The bigger picture required the entire space of the book. I simply was unable to judge it adequately on the first five pages. Now I’m a busy gal. I run everywhere and multitask constantly. But I’m still in favour of reading (and to be honest, writing) slowly. I don’t believe that it’s healthy to consume everything so quickly, and discard so readily. It just doesn't allow digestion to occur properly, and I mean that both literally and metaphorically. Surely there’s still value in teaching our children (and ourselves) to wait for gratification? If we don’t at least occasionally learn to wait a little we’re in danger or making judgement too soon, and allowing our desire for constant external stimulation to stop us from experiencing the beautiful in favour of the quick. Your thoughts? I wanted to do something new, so here is a video of me reading the title poem from my upcoming poetry collection Repulsion Thrust available in December 2009 from BeWrite Books. I've been been meaning to play around with video for some time, so this is my first shaky attempt (Bellbirds, roosters and all). My editor called this poem "Audenesque". I actually have a reference to Pound in it, but Auden will do! An old guest blog reprint just to get the ball rolling (no pun intended). New stuff of all descriptions coming soon. Welcome! Let me start by saying, right up front, that publishing poetry is generally not a road to riches. Most of us write poetry for reasons other than its hot selling power. Of all genres, poetry is probably the hardest to sell. I’m not entirely sure why this is the case, but I’ll hazard an educated guess that it’s because there’s a kind of misconception that poetry isn’t an engaging read (not suitable for the beach or an airplane), isn’t an easy read (the “highbrow fallacy”), and that it isn’t going to improve you in any way (unlike self-help books, which will cure your diseases, make you slimmer, and attract lots of good stuff to you). Don’t say I didn’t warn you. So why bother? Why not just write a diet book? Here are two reasons why poetry matters. That is, as Auden said so beautifully in “In Memory of WB Yeats”, poetry connects us in ways that go deeper than any other words can. It endures, and continues to move us, in the writing and in the reading, regardless of literary trends, political activity, and its overall saleability. That is, as William Carlos Williams said so beautifully in “Asphodel, That Greeny Flower”, there’s an inherent power in poetry to move beyond the boundaries that divide us; to jump over the cliffs between us; and move beyond those lines of race, class, age, and above all, our innate fears, and reach a place of common humanity. Life is busy, and it’s so easy to forget to look into one another’s eyes; to talk in convenient syllables and soundbites rather than sincerely; to miss what matters under the big pile of what’s urgent. In other words, and let me say this very clearly, good poetry is important. It’s important to our inner life, and where it succeeds, it succeeds hugely, becoming lodged in our consciousnesses. Like the two poems above, which I’ve carried around in my head since I came across them as a young teen, good poetry sticks with the reader. It continues to be recited and cited and in its own beautifully viral way, changes who we are and how we see our lives and our world. So poetry matters, and we need to keep reading and writing it, even if it isn’t an easy sell, because it will be with us long after the South Beach Diet has been forgotten. But how, as a poet, do you become “lodged?” How do you promote your poetry so others read it? Firstly, remember that good poetry is as pleasurable to read as it is to write. If you write it, you have a responsibility to read the best work of others. You’ll be a better poet as a result and who knows, you might start a trend. If you don’t know where to start, try Dorothy Porter, Billy Collins, Charles Simic, Les Murray, or Luke Davies. Those are a few of my favourites, and writers whose work is consistently beautiful, passionate, modern, relevant and accessible. Or try the classics, Williams, Frost, Yeats, Auden, Plath, Brooks. Try purchasing an anthology. Black Inc do an annual anthology of Australian poetry (Best Australian Poems 2008 was edited by Peter Rose), Scribner does one for American poetry, (Best American Poetry 2008 was edited by Charles Wright) and there are similar books for Canada and England. Or try a literary journal – there are plenty to choose from. Great poetry will inspire great poetry, even if you write nothing but prose. The perfectly chosen word is always worth reading, and emulating. Secondly, don’t limit yourself to the printed page. Poetry isn’t sacred. It began as our earliest oral tradition and continues to be most effective delivered orally. Sing, dance, recite, move about, use props. Think Dylan, Leonard Cohen, Patti Smith. You don’t even have to have a good voice– just confidence (easily feigned), and some performance acumen. Look your audience in the eye, remember they’re on your side, and connect. But just because you’re adding props, music, and chutzpah doesn’t mean you can use cliché, ineffective imagery, or be ridiculous. I once saw a poet perform his work while eating a banana. It wasn’t pretty. There’s a fine line between great work and a fun performance. Find it and walk it. Don’t forget to bring books to sell with you either, because you’ll sell more work at a live performance than anywhere else. Then you can capitalize on the buzz with websites, blogs (like this one), reviews of other poet’s work, and samples. Finally, network. Poets should support one another. Writing poetry doesn’t need to be secretive, lonely, or tortured. We should buy, review, and talk up each others’ work (where deserved); and if you find something good, by all means, shout about it. Collaborate, coordinate, cross-promote, and above all, celebrate. Because great poetry, and by that I mean words that sear and sting and open every pore, are cause for celebration. You can take that to the bank.